A tour of Charleston harbor is the perfect way to take in the sights beyond the city proper. 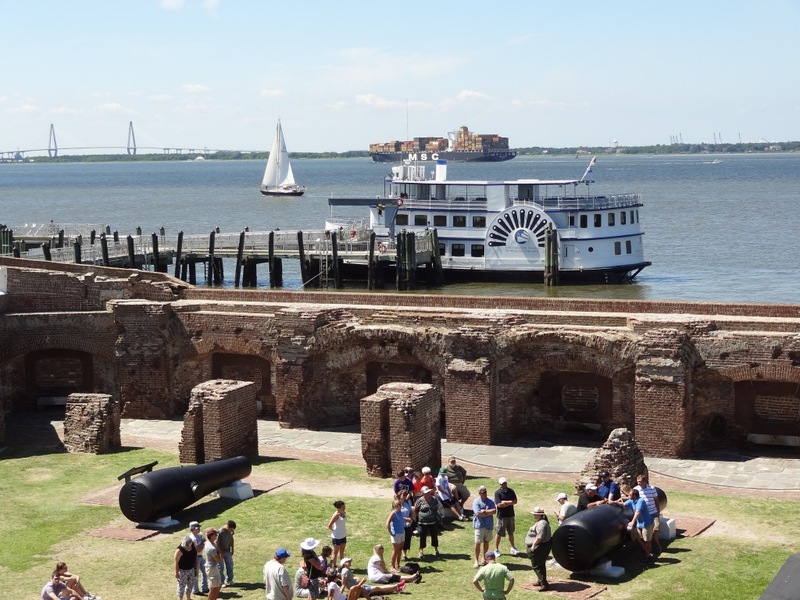 Whether you catch the ferry out to Fort Sumter or cruise around the harbor aboard a paddlewheel riverboat or a three-mast schooner, you will view an intriguing array of nautical and historical points of interest. Above is a panoramic view of the Holy City as seen from the harbor. Notice the number of church spires easily spotted even at this distance. The USS Yorktown was towed into Charleston Harbor in June of 1975. Four months later—on the 200th anniversary of the U. S. Navy—the battleship was dedicated as a memorial. Built and commissioned during World War II, this mammoth aircraft carrier participated in several campaigns in the Pacific Theater and earned eleven battle stars as well as the Presidential Unit Citation. It was named a National Historic Landmark in 1986. Moored at Patriots Point, the Yorktown is open for daily tours. Built in 1810, Castle Pinckney is a brick and mortar fortification that never actually saw military action; it briefly served as a prison for captured Union troops during the Civil War. Ownership has changed hands a number of times and restoration attempts have been made, but the location of the fort on a small island in the middle of the harbor makes access difficult. Castle Pinckney was added to the National Register of Historic Places in 1970. Located on Sullivan’s Island, Fort Moultrie was built to protect the city of Charleston. Union Major Robert Anderson moved his troops from this fort across the harbor to Fort Sumter in December 1860, precipitating events that would lead to the Civil War. Interestingly, the entire 171-year history of American seacoast defense (1776–1947) has been documented as related to Fort Moultrie—the only area of the National Park system to be able to make this claim. Fort Sumter is best known for its pivotal role in the outbreak of the American Civil War when shots were fired upon Union forces garrisoned there on April 12, 1861. The fort is accessible via a half-hour ferry ride from Charleston several times daily. Since 1970 six flags have flown over the fort—the current U. S. flag as well as five flags which represent a timeline of the fort’s history during the Civil War period. They are the United States flags of 1861 and 1865, the Confederate States flags of 1861 and 1863, and the South Carolina state flag—adopted in 1861 and still current. Tugboats and gigantic container barges like these pass through Charleston Harbor mere feet from smaller recreational watercraft every day. Looking across Charleston Harbor from atop the ruins of Fort Sumter. In the distance on the left of the photo is Arthur Ravenel Jr. Bridge; in the center, three of the watercraft commonly seen in the Harbor—a sailboat, a barge, and the ferry that shuttles passengers back and forth between Charleston and the Fort.